NFL Films and the NBS Sports Group will be working on the production of a new NFL program entitled NFL Turning Point, which will air weekly on Versus during the season. The premise of the show is to use the production skills of NFL Films to get behind-the-scenes of two NFL match-ups each week. The program will revolve around the key play or plays of the game, the turning point, if you will. The program will be enhanced by NFL Films’ access to the players and coaches for each game. NFL Turning Point will debut on Versus Thursday, September 15th at 10pm ET. After our special on Monday we are back with our regularly scheduled edition of the Sports Media Weekly Podcast. In this week’s news segment Ken Fang of Fang’s Bites and I discuss the re-branding of Versus into the NBC Sports Network and Sporting News Radio into Yahoo! Sports Radio and their potential impact in competing with ESPN. We also discuss how an agreement between Westwood One and Dial Global will benefit the radio network. We look at two new additions to ESPN’s stable of NFL analysts (one of particular interest to Ken) and the wait-and-see attitude by the Big East Conference in the future of its television packages. Our guest this week is Andrew Catalon, sports anchor at News Channel 13, WNYT in Albany New York. Some of you may remember Andrew as the voice of curling at the 2010 Vancouver Winter Olympics on NBC. Andrew talks about his curling background, his work for CBS Sports on coverage of the U.S. Open Tennis Tournament and the Masters, and covering sports in New York’s state capital. The NBC Sports Group today announced that Versus will be renamed NBC Sports Network effective January 2nd. This name change had been rumored for some time and may be seen by some as NBC’s move to launch a strong challenge to ESPN. NBC Sports Group hopes to use the NBC Sports Network as the 24/7 platform for all of NBC Sports properties. 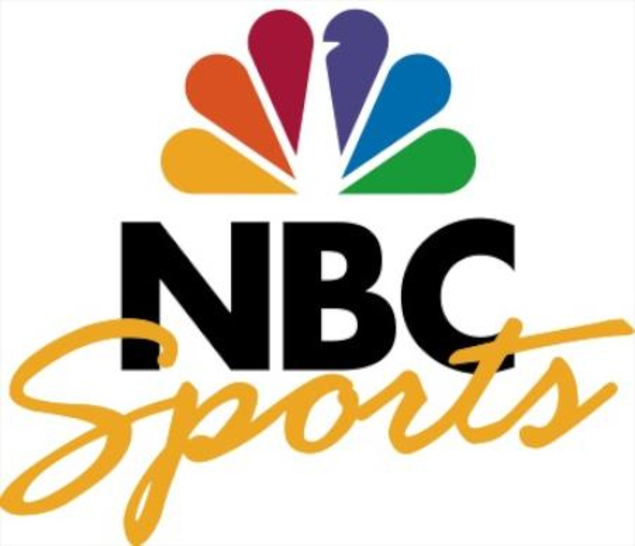 As you can see NBC Sports Group is adapting its NBC Sports logo into the new NBC Sports Network logo. With the change coming on January 2nd, NBC will use its coverage of Sunday Night Football on January 1st as well as the NHL Winter Classic and the NFL Wild Card Playoffs to launch a cross branding of the new network. After a week off Ken Fang of Fang’s Bites and I are back with another edition of the Sports Media Weekly Podcast. This week Ken and I discuss a possible plan by the NFL to compromise with the Players’ Association on the 18-game schedule by instead implementing a Thursday Night game every week of the season beginning in 2012. We discuss which network might be interested in the telecasting of 8 games each season. The NFL Network already telecasts 8 Thursday night games each season. We look at respectable ratings for Game 7 of the NHL Stanley Cup Finals, especially in Boston. We also touch upon the news that Al Michaels and Bob Costas will be sharing the duties calling next Friday’s Mets/Giants telecast on the MLB Network. We talk about the coverage of the Women’s World Cup and Wimbledon and Ken provides an overview of the recently completed Boston Sports Blogapalooza event last weekend in Boston. NBC Sports says the overnight ratings for yesterday’s Belmont Stakes registered a 4.8, 55% above last year’s race. That’s the highest rating for the Belmont since 2005 . NBC Sports Group is also touting its four hour pre-race coverage on Versus. The last portion of the coverage (5pm-6:15pm) had an overnight rating of 2.6, 86% higher than last year’s coverage on ABC. Second Round coverage of the playoffs begins tonight on Versus with Game 1 of the series between the Nashville Predators and Vancouver Canucks. NBC begins its second round coverage Saturday with Game 1 of the Boston Bruins at Philadelphia Flyers. Big Ratings Number for the NHL on NBC Sports Group- The NBC Sports Group reports that ratings for the first round of the NHL Stanley Cup Playoffs on its properties were up 22 percent over 2010. Versus saw ratings which were the highest NHL Playoffs on cable in 17 years. NBC numbers were the best for network coverage of the NHL post season first round in seven years. TNT Seeing Great Ratings Numbers In Early NBA Playoff Coverage- TNT is reporting that it’s average rating thus far in it’s coverage of the NBA Playoffs is 2.7, up 29% over 2010 levels. The average viewer number of 4.3 million is up 33% from 2010. Turner Sports also reports that viewership is also up among all key demographics. ESPN to Produce Centennial Moments to Commemorate 100th Anniversary of Indianapolis 500- Beginning May 1st, ESPN SportsCenter will air video segments looking back at some of the great moments from the Indianapolis 500, which will celebrate its 100th Anniversary this year. This year’s race will air on ABC on May 29th. NBC Sports Group Preps for Coverage of the Kentucky Derby- The NBC Sports Group will be providing 14 hours of Kentucky Derby coverage over Versus and NBC. Coverage on Versus begins May 4th. The Kentucky Derby will air on NBC Saturday, May 7th beginning at 4pm ET. MLB and NASCAR This Saturday on Fox- Fox has unveiled it’s weekend sports line-up, with the Fox Saturday MLB Game of the Week featuring the St. Louis Cardinals at Atlanta Braves which will be seen in 52% of the country. Kenny Albert and Mark Grace will have the call. 25% of the country will have Josh Lewin and Eric Karros on the call of the Los Angeles Angels at Tampa Bay Rays while the rest of the country will view the New York Mets at Philadelphia Phillies with Matt Vasgersian, Tim McCarver, and Ken Rosenthal calling the action. Game time is 1pm ET. At 7:00pm ET Fox will bring live coverage of the NASCAR Sprint Cup race from the Richmond Motor Speedway. ESPN has Roundtable Discussions on Top 20 College Football Teams Heading Into New Season- ESPN’s College Football Live will feature special roundtable discussions on the status of the preseason top 20. The first program will air Monday, May 2nd at 3:30pm ET. The last of the 20 shows will air Friday, May 27th. ESPN Announces Announcing Team for FIFA Women’s World Cup- Ian Darke and Julie Foudy will serve as the lead commentators for ESPN’s coverage later this summer of the 2011 Women’s FIFA World Cup to be held in Germany. Darke played a lead role in the WWL’s coverage of the 2010 Men’s World Cup in South Africa while Foudy will serve as the lead analyst for her second Women’s World Cup. Masters Ratings Second Highest in Ten Years- CBS is reporting that the ratings for the final round of the Masters averaged a 10.4. Even though it fell below last year’s 12.0 rating, it is still the second highest rated final round for the network in the last ten years. Masters Online Also Scores Big- CBS is also reporting that its Masters Live product on CBSSports.com saw a 33% increase in traffic with time spent viewing online averaging 72 minutes per viewer. NBC Sports Group Prepares for Coverage of the NHL Stanley Cup Playoffs- NBC Sports Group has announced that it will have blanket coverage of this year’s Stanley Cup Playoffs on NBC, Versus, and various local Comcast SportsNet outlets. NBC begins coverage this Saturday with Game 2 between the Phoenix Coyotes and the Detroit Red Wings at 1pm ET. NBC returns Sunday at 3pm ET with coverage of Game Three in the series between the Washington Capitals and New York Rangers. Versus will kick-off the playoff season with a triple header Wednesday night beginning at 7pm ET with Game 1 of the Coyotes and Red Wings, followed, in progress, with Game 1 of the Rangers at Washington, then capping the night off with Game 1 of the Chicago Blackhawks at Vancouver Canucks at 10pm ET. Sirius-XM has Horse Racing Triple Crown Covered- Sirius-XM Radio has announced that it will broadcast all three races of the Triple Crown this spring. Coverage of all three races, The Kentucky Derby, The Preakness, and The Belmont will begin at 5pm ET on Sirius Channel 126 and XM Channel 243.